A Boy's Room - Oak House Design Co. Boys rooms can be a difficult thing to decorate. If you look online you're often limited to plaid patchwork quilts or the latest superhero theme. Nothing wrong with those, but I just don't want to have to redo the room when he outgrows whoever or whatever he's into at the moment. I have been brainstorming ideas forever and came up with this mood board a few months ago, but have had cold feet when it came to pulling the trigger. 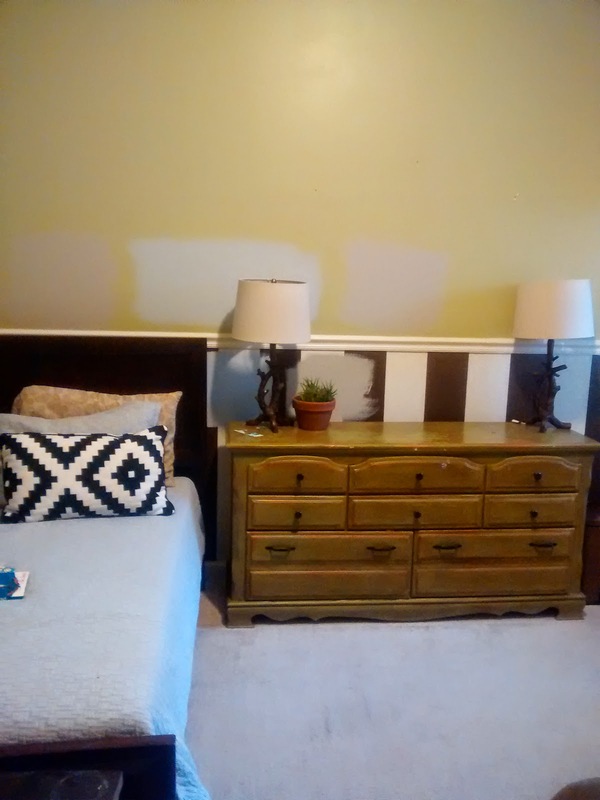 This past week, I finally got fed up with my own indecision and the state of his room and decided to make a move. Whatever I did, I felt would be a step up from what he had going on, which was last done when he was a baby. I am a decidedly neutral-loving girl, but my boy is full of energy and requested bright color. Bright wall colors make my heart hurt (ha-ha! ), so we are working toward a compromise. Originally I was thinking of going with a light gray on the wall, but as you can see I have gray-blue on the walls. It reminds me of the sky and atmosphere. The room isn't complete and we may change the wall color to something bolder, but we've got a start on the space. I have a loose 'night sky/night-time' theme for the room. The Bub is a night owl, and has fought sleep since they day he was born. He gave up naps at age two and never willingly goes to bed. We also used to stargaze at night in the summer and count the stars as they came out. So when I saw the star chart poster, I thought it would be cool since it identifies the constellations in the night sky. I also have to finalize the artwork for the gallery wall frames over the dresser. I am planning to have the Bub recreate some artwork they did in Kindergarten of the phases of the moon for the lower frame with the three sections. And then I have a poster that reads, "Shoot for the moon, even if you fail, you'll land among the stars." That will go in the frame above the owl. I'm excited to get those up in the frames. This unit from Ikea is essential for corralling all of the toys that kids seem to have. The sections and bins are lifesavers. I still want to add a pinboard over the cube storage to post up some of his artwork from school and other things of interest to him. Although I don't see a bright neon color on the walls, I can envision bringing bold color in by perhaps painting the bed in a bold reddish-orange or grass green. He also has a play table that could be repainted in a matching color. We often think that to add color it has to be on the walls, but bold color can be just as a effective used in textiles and furniture. I am also debating bringing in the chalkboard and book ledges from the playroom, since it has become somewhat defunct. Pretty much all of the toys and art supplies have been moved to his room. I am also looking into some new bedding to coordinate with the space. But I like the direction we are moving in. To see some of my inspiration for boy's rooms, check out my Boy's Room pinterest page.